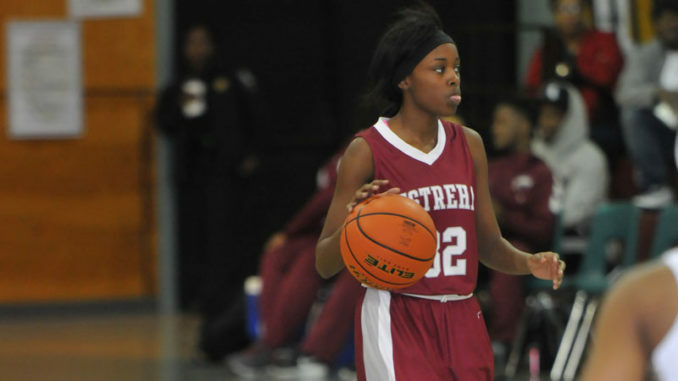 Destrehan point guard Darielle Richard brings the ball up. After the departure of the majority of rotation players from last season’s undefeated Destrehan Ladycats state championship team, a rebuilding campaign was all but inevitable. Still, first-year head coach Meagan Stock sees her team growing and improving as the season rolls along and is optimistic these Wildcats can make a splash once their District 7-5A schedule kicks off against archrival Hahnville on Jan. 3. While Destrehan entered the week with a record of 2-9, the team has faced strong competition that includes three defending state champions from a season ago. It’s been a reshaping process from the ground up for a program that in almost every way was coming off of a dream season led by Louisiana Player of the Year and current Baylor freshman Cara Ursin. This year’s team is led by a senior class Stock said has taken their leadership roles to heart, anchored by team captains Kayla Davis, a forward, and Marshay Stevenson, a guard. The team has had to cope with the loss of starting point guard Darielle Richard to an ankle injury — she has been sidelined since an early season tournament at Ursuline. Stock was hoping to have her return this week, but in her stead Deja Sanchez has emerged and shown versatility in taking to the point guard role for the first time. She said the biggest improvement the team has made so far has come in the area of fundamentals, particularly with regard to the team’s passing. The Ladycats opened the season with a decisive victory over Grace King, suffered losses in their next six games before bouncing back with a 56-53 win over McMain. Stock said she was proud of the fight her players showed down the stretch.